This iMac is in good working condition, the case will have some scratches on them, the screens are in perfect condition. This is a Clearance model as it does not run some current software. 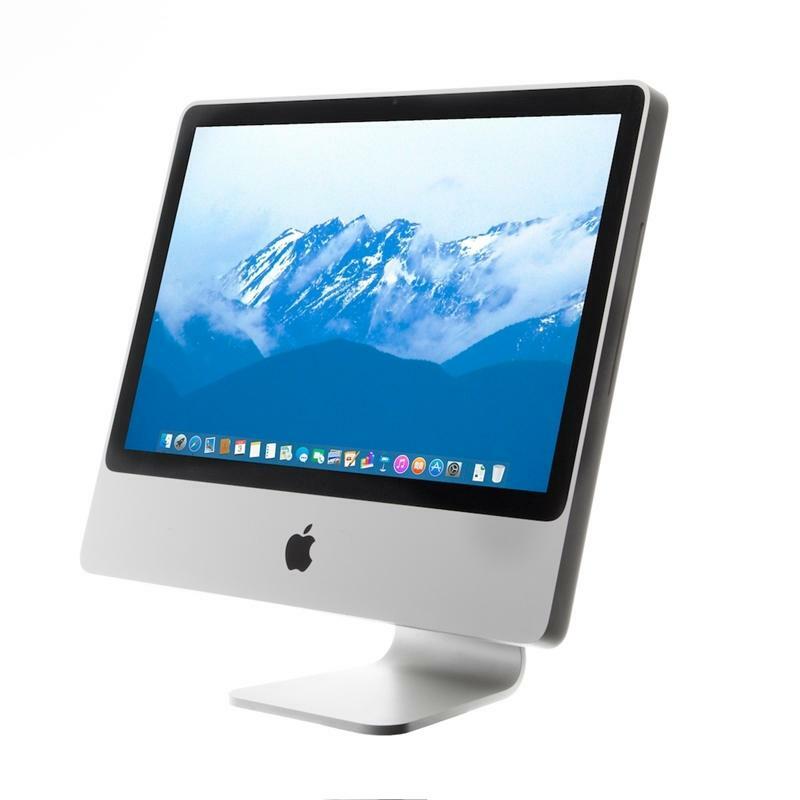 The iMac “Core 2 Duo” 2.66 20-Inch Aluminum (Early 2008/Penryn) features a 2.66 GHz Intel “Core 2 Duo” processor (E8335), with two independent processor “cores” on a single silicon chip, a 6 MB shared level 2 cache, a 1066 MHz system bus, 2 GB of RAM (800 MHz DDR2 SDRAM, PC2-6400), a 320 GB (7200 RPM) Serial ATA hard drive, a vertically-mounted slot-loading DVD�R DL “SuperDrive”, ATI Radeon HD 2600 PRO graphics acceleration with 256 MB of GDDR3 memory, a built-in iSight video camera, and built-in stereo speakers underneath the 20″ glossy TFT Active Matrix LCD (1680×1050 native) display. Externally, the iMac “Core 2 Duo” Aluminum (Early 2008/Penryn) models essentially are the same as the original Aluminum models that these replaced, with the same housing and glass cover that “joins precisely to the aluminum enclosure creating a virtually seamless front surface”. The Early 2008/Penryn models, likewise, are paired with the same “ultra-thin alumium” Apple Keyboard (0.33 inches at the front edge). Internally, however, the “Early 2008/Penryn” revision of the “Aluminum Core 2 Duo” models have faster and more energy-efficient 45 nm “Penryn” processors — compared to 65 nm “Merom” processors in the original “Aluminum” models — larger level 2 caches (6 MB compared to 4 MB), faster frontside buses (1066 MHz compared to 800 MHz), and faster memory (PC2-6400 compared to PC2-5300). Some configurations shipped with more default memory as well.